Isiah Factor | The Insite » MIKE BARAJAS TAKES HOME TWO MAJOR AWARDS IN ONE WEEK! 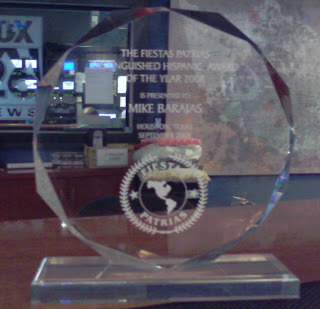 MIKE BARAJAS TAKES HOME TWO MAJOR AWARDS IN ONE WEEK! September 4, 2008 | Posted in Uncategorized | Comments Off on MIKE BARAJAS TAKES HOME TWO MAJOR AWARDS IN ONE WEEK! HIS DESK WILL NOW BE FULL! 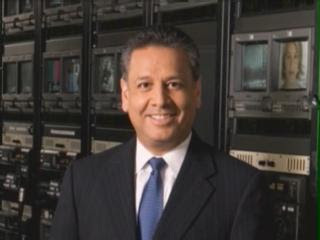 Congratulations to FOX 26 main anchor Mike Barajas. He had the honor of taking home two major community awards this week. The busy tv anchor also picked up the trophies in person and gave the Insite the opportunity to get shots of the awards. #1 is from the Mexican-American Bar Association of Texas Foundation. Mike took home the coveted Service Award and was called a Pioneer in the media industry. Award #2 is from the Fiestas Patrias group. 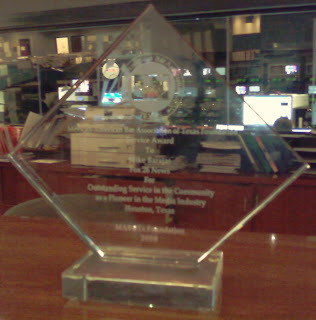 This honor was for the Distinguished Hispanic Award of the Year for 2008. Congratulations Mike on the great awards!